I don't know about you, but we have a busy weekend ahead of us! Shane and Grayson are presenting the family trophy at the Royal Canadian Air Cadets Annual Ceremonial Review tomorrow and we are celebrating Sam's second birthday on Sunday! We'll also try to get some boxes moved to the new house and finish up some final yard work if the weather holds. Here are some great links to check out this weekend no matter what the weather in your area is like! 1) Are you a basic scrapbooker? Basic Grey that is!? Oooh...I love all things Basic, and their June Newsletter has some fabulous inspiration and ideas, geared specially for weddings using their stunning Capella line. So lovely! And don't miss the Basic Sketch by Kelly Goree. All in all it's a great weekend read. 2) Father's Day is next Sunday! If you have some time this weekend, why not create a special card just for him? Scrapbooks etc. has some cool original ideas. 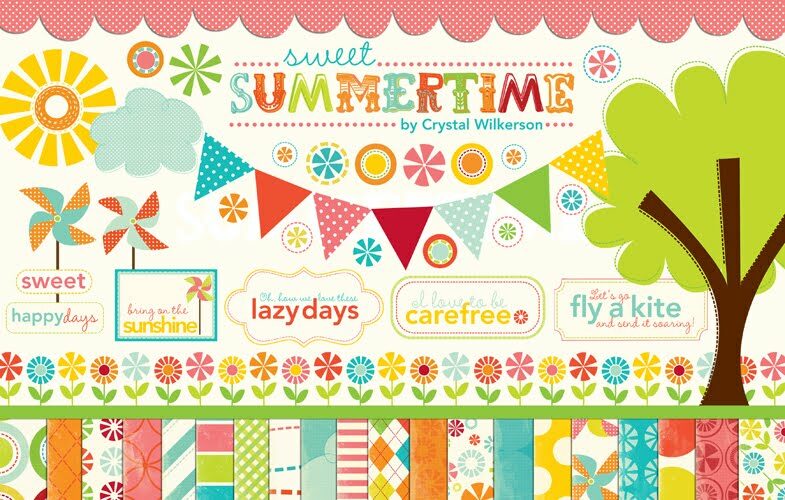 3) One of my favorite digital designers Crystal Wilkerson has recently had her designs made into a traditional scrapbook supply collection called "Sweet Summertime" by Echo Park. I love this collection and since the shipping to Canada was expensive, I opted to buy the digi version instead! (I love the little banners and the tree!) 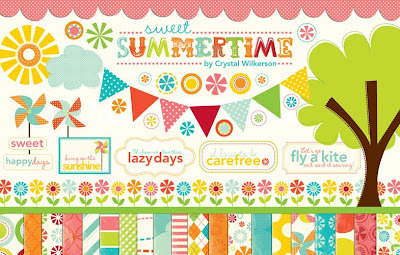 Crystal and her friend Kristina Proffitt also design blogs and share freebies in the same fun whimsical style. Visit Kristina's blog for some free word art created for the Cards for Kids drive. You can download it, print it out and use it on a variety of cards. So cute! 4) The Scrapbook & Cards Today blog has great tutorials every week. This week find out how to glitz up your plain die cuts. While you're there, make sure to download your free copy of the Spring 2010 Magazine if you haven't already. And make sure to enter for your chance to win the Friday Freebie of some Quickutz Dies! Speaking of Summer, yesterday I mentioned that I was finalizing plans for our SMS Summer project and told you you'd have to wait until Monday for all the details. But just to give you a little hint, it's a scrap-a-thon...a Summer Scrap-A-Thon! Yes...we'll be scrapping all summer long, with lots of prizes and great inspiration! Watch for details next week and get ready to join in starting the first day of Summer...June 21st! Oh yeah...it's gonna be a great summer! Have a great weekend! Thanks to the link to my site Noreen!! Appreciate it! Summer scrap-a-thon sounds fun - looking forward to it! Thanks for posting about Scrapbook & Cards Today. That glitter tutorial is great! I'm going to have to try that out. Good luck with the move! Can't wait for the scrap-a-thon!